We’ll cut straight to the good stuff, because that’s want you really want, right? If you want to persuade someone,what you have you have to let them know what you have for them. But don’t over complicate it. 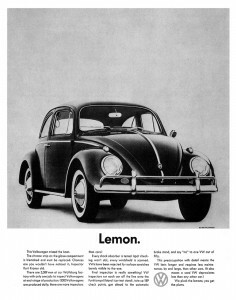 Start with a simple overview of your product – what does it do and who is it for? Talk about the insane benefits that your reader will get when they take the action you want them to take. Can you help them imagine or realise how much better life will be with your product? Now we can unpack the rest of your product. But there’s a secret about how to do it right. If you don’t, your prospective customer will feel nervous. And nervous people don’t buy into what you’re selling. So here’s how to list your features, in the most fascinating way. Bullet points can be your secret weapon to persuasive copy – they make a point and are easy to skim. But there’s a science to compelling bullet points! Don’t skimp on the details, and add a benefit to every feature. More than 15 hours one-on-one consultation, with complete transcripts so you don’t forget anything. And don’t forget a compelling teaser! The three mistakes that female entrepreneurs always make, and the quickest way to fix them. Whether or not your reader knows who you are, it’s critical that you establish you’re trustworthy and credible. And that you really know what you’re talking about – an expert in the topic you’re referring to. This is our all-time favourite. The famous call to action. Here you need to tell your reader exactly what you want them to do. And if you do, they’ll do it. And if you want to supercharge your call to action, you can add a sense of urgency. Feeling inspired, about how simple this content thing really is? Tell us over here on Facebook, Twitter or LinkedIn, or ask a question now (and we’ll give you some more ideas that will help transform the way you communicate with your ideal customer). For more content tips that work ridiculously well, head to masters who inspire us, like Copyblogger. 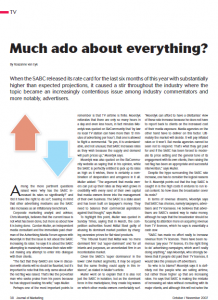 TV: Much ado about everything? 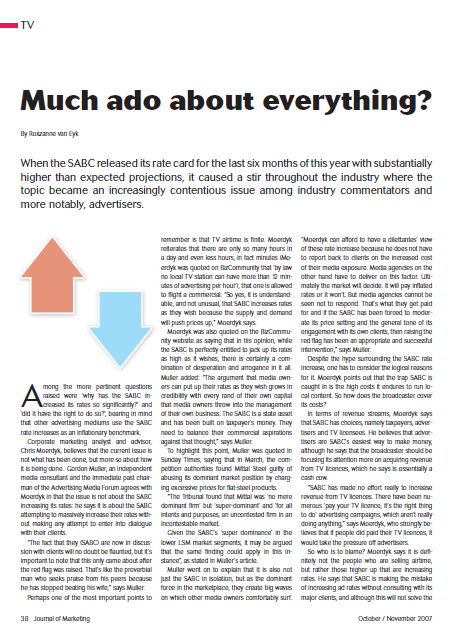 When the SABC released its rate card for the last six months of this year with substantially higher than expected projections, it caused a stir throughout the industry where the topic became an increasingly contentious issue among industry commentators and more notably, advertisers. 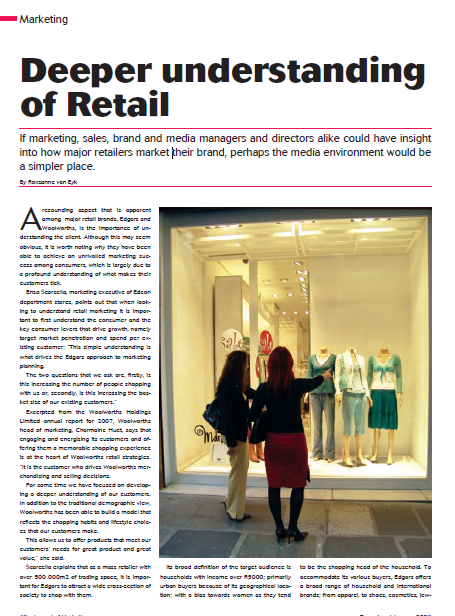 The Journal of Marketing provides cutting-edge reporting on all issues pertaining to the marketing professional, spanning media, branding, design, advertising and strategy to encompass the 360° approach that today’s marketers must adopt in order to generate ROI for their clients. 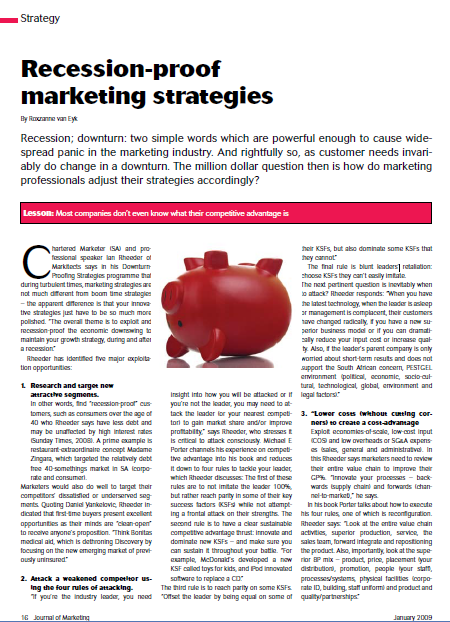 Recession; downturn: two simple words which are powerful enough to cause widespread panic in the marketing industry. 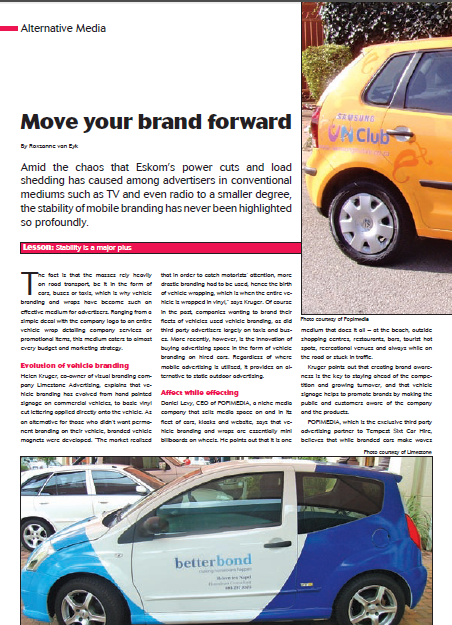 And rightfully so, as customer needs invariably do change in a downturn. 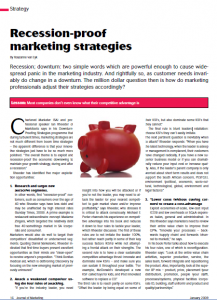 The million dollar question then is how do marketing professionals adjust their strategies accordingly? Lesson: Most companies don’t even know what their competitive advantage is. 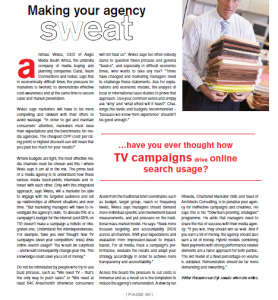 …have you ever thought how TV campaigns drive online search usage? 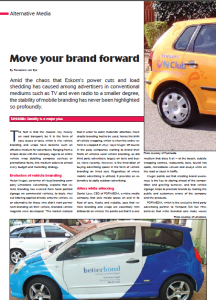 Amid the chaos that Eskom’s power cuts and load shedding has caused among advertisers in conventional mediums such as TV and even radio to a smaller degree, the stability of mobile branding has never been highlighted so profoundly. Lesson: Stability is a major plus. 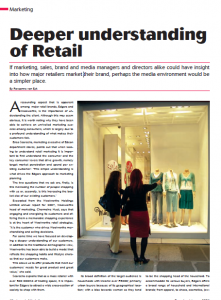 If marketing, sales, brand and media managers and directors alike could have insight into how major retailers market their brand, perhaps the media environment would be a simpler place. 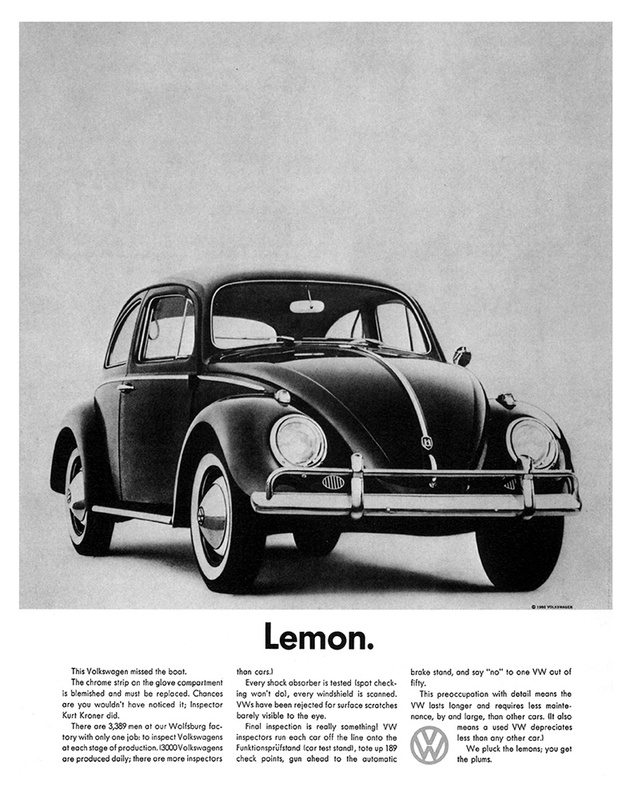 This article provides marketing insights including brand measurement, the strength of strategies and the secret to success. 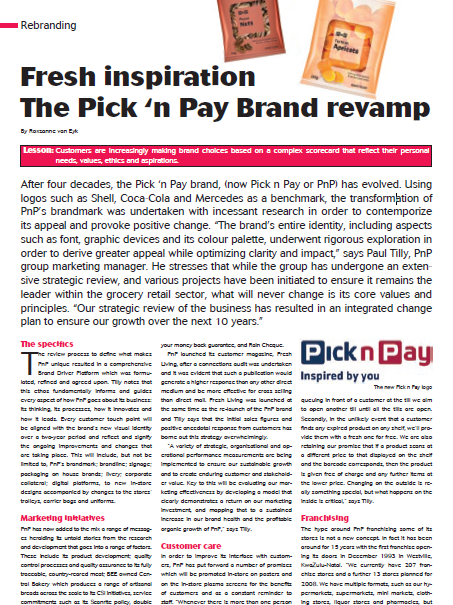 After four decades, the Pick ‘n Pay brand, (now Pick n Pay or PnP) has evolved. 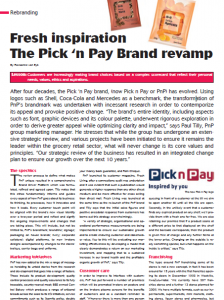 Using logos such as Shell, Coca-Cola and Mercedes as a benchmark, the transformation of PnP’s brandmark was undertaken with incessant research in order to contemporize its appeal and provoke positive change. To read full article, click here. The mind races with possibilities. Customer Service Is Not Marketing..But It Should be! The biggest mistake a brand or company can make on social media is not responding *properly* to comments and complaints on their page. Consider how your brand is being perceived by your response? You can manage the feedback that is given and use the opportunity to resolve the issue and gain important insight into what’s not working in your business. Connect with Click Culture on Twitter here, or become a fan on Facebook here.